Onex (pronounced “One-X”) is a single-seat aircraft designed to offer an even-more economical way to build and fly your sport pilot aircraft! The folding-wing design can fit into a standard 7’ garage door, and the wing panels can easily be removed for trailering at highway speeds. 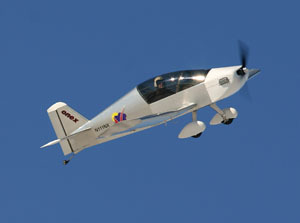 The Onex follows the Sonex Aircraft design and engineering tradition in offering a simple, robust, aerobatic aircraft capable of squeezing incredible performance out of lower powered engines. Onex concept models showing wings extended and folded, both tri-gear and standard gear configurations, and showing scale relative to standard 7 foot garage door opening height as well as scale relative to vehicles. (Click to Enlarge All Images).